The most important place to clean a rotary tumbler barrel is the rim where the lid seats and the edges of the lid. We clean these areas with a toothbrush. Keeping these areas clean removes any grit and rock particles that might contaminate your batch of rocks or prevent the lid from sealing properly. While we have the toothbrush we also clean the bottom edges of the barrel - where the bottom meets the sides. That is a favorite hiding place for grit and rock particles. A perfectly clean rock tumbler barrel is a very important part of achieving a great polish on your tumbled stones and preventing a leaking barrel. Two minutes spent on a thorough cleaning of the barrel can make a big difference in your tumbling results. A clean barrel prevents particles of coarse grit from remaining in the barrel when you move to the medium grit step. A few particles of coarse grit in the barrel during the medium step will scratch up your rocks and ruin your polish. 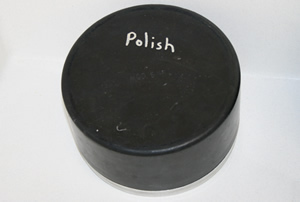 The same thing can happen if medium grit contaminates your fine step, or if fine grit contaminates your polish. A clean barrel helps prevent grit contamination. Keeping the rim of a rotary tumbler barrel and edges of its lid clean will help prevent leaking barrels and lid pop-offs. Leaking lids can make a mess and a lid pop-off can take an hour or more to mop up. A few grains of grit or a few rock particles are all that is needed to cause a leak or a pop-off problem. Clean your barrel rims and barrel lids so that they seat perfectly together and make a water-tight seal. When you finish tumbling a barrel of rocks, cleaning the barrel should be your first priority. Wet rock mud can be removed from the barrel by rinsing combined with a small amount of elbow grease. Once the mud dries on the barrel it sticks to the rubber and is not easy to mobilize. Do this job right away. Cleaning will take less time if you do it promptly and require less effort. We use a toothbrush to clean the edges of the lid. 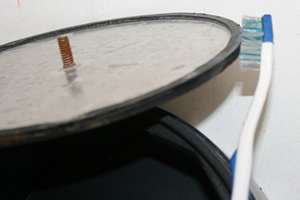 We find that a toothbrush works great for cleaning any of our rock tumbler barrels. The bristles remove grit and rock particles from the rim of the barrel, the corners where the bottom meets the sides of the barrel, and around the edges of the barrel lid. We also use the toothbrush to clean the edges, rim and rough spots on our Lot-o-Tumbler barrel and under the rim of our Thumler's U-V10 vibratory tumbler bowl. Brushes with soft bristles wear out quickly doing this type of work. We find that medium and hard bristle brushes work better and last longer. There are lots of different types of brushes that could be used for this job. You might find a brush that works even better than a toothbrush. Soap isn't needed. If you use soap, select something mild that will not harm the rubber barrel and avoid oil soaps. When we use soap we use a single shot of Dawn Direct Foam. 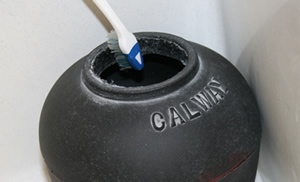 We also use a toothbrush to clean our vibratory tumbler barrels. The Lot-o-Tumbler has a rough opening that can trap grit. We scrub it with a toothbrush and reach into the barrel with the brush to scrub the top of the barrel's dome. Mud can accumulate there. 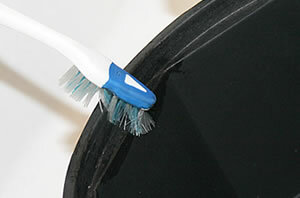 We use a toothbrush the same way to clean the edges of our Thumler's U-V10 vibratory bowl. The Lot-o-Tumbler barrel has a well in the bottom that seems to be perfect for trapping ceramic pellets and small tumbled stones. When we first started using a Lot-o-Tumbler we were using a long-handled screwdriver to liberate rocks and pellets after every cycle. Some of these were so hard to extract that we worried about damaging the barrel. Eventually we stopped fussing over these trapped stones and allowed them to stay trapped in the well. This has not seemed to cause a problem. It seems like anything that goes into that well stays there! Don't Forget to Clean the Rocks! Spending all of this care and effort on cleaning the barrel is wasted if you don't clean your rocks thoroughly when moving from one size grit to another. Be sure that your rocks are absolutely clean before loading them into the barrel for the next step. It is also a good idea to inspect your rocks at the end of the coarse grit step. Remove any that have pits, cracks or curvatures where grit might be hiding. These rocks can carry coarse grit into your medium, fine or polishing step. That can dull your final polish or ruin it completely. These rocks should be discarded, broken, retumbled in coarse, or cleaned thoroughly before they move on to the next step. Some people have a dedicated barrel that they use for the polishing step. This is a cleanliness precaution that we have read multiple times in magazine articles and rock tumbling guides. Steve Hart, author of Modern Rock Tumbling says that a dedicated polishing barrel is a "good idea" and Joe Warzin, author of Lapidary Barrel Tumbling, says that he "always uses a separate barrel just for polishing". We do almost all of our polishing in a Lot-o-Tumbler and have a separate barrel for use if we are trying to achieve the "best possible polish". The most important time to have a clean barrel is during the polishing step. A couple pieces of silicon carbide grit in the polish step will put scratches all over your rocks. Be sure that your barrel is perfectly clean before loading it for the polishing step. Steve Hart, author of Modern Rock Tumbling, makes a couple of suggestions for the polishing step. One is a soap tumble before polishing. The other is a dedicated barrel for the polishing step. For the soap tumble he suggests doing a thorough cleaning of the barrel and the rocks. Then he then loads the rocks into the barrel, adds water as usual, adds a tablespoon or two of grated Ivory bar soap or Dreft powdered detergent and tumbles the rocks in this soap bath for twenty-four hours. This soap tumble will clean the barrel and liberate particles of grit that are loosely hidden in a pore space or crack in one of your tumbled stones. His second suggestion (which we have also read from other authors) is a dedicated barrel for the polishing step. If you do an extra good job of cleaning or do the twenty-four hour soap tumble a dedicated barrel is not necessary, but some people use a dedicated barrel in an effort to achieve best possible results.